You are here: Home / Job Openings / Be An AirAsia Zest Cabin Crew! 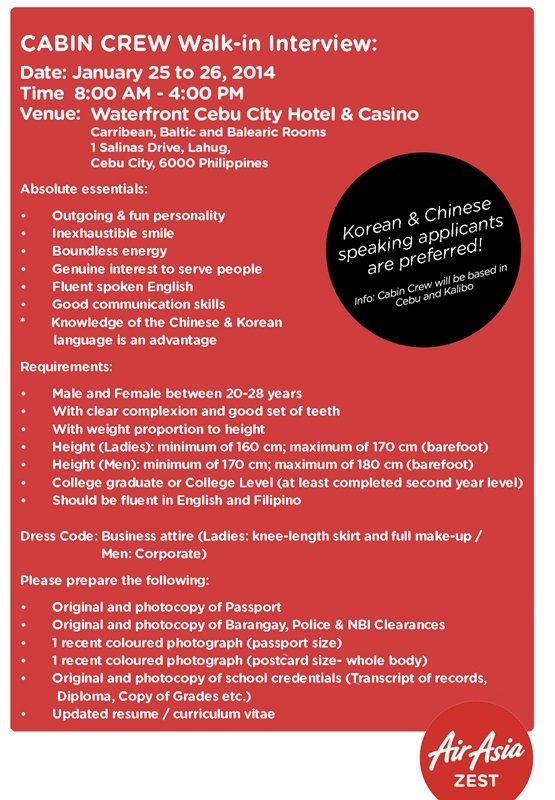 Apply Now in Cebu! Be An AirAsia Zest Cabin Crew! Apply Now in Cebu! What is your ideal job? Is it to travel and visit new places? It is to join a well-reputed company? Is it to find a highly rewarding job? If you answered yes to any or all of the question, then this awesome job opportunity might be what you are waiting for! Go on now, prepare and apply to become a stewardess or a steward! *Knowledge of the Chinese and Korean language is an advantage. Goodluck! Hope you make the cut and that we see you on one of the future flights of AirAsia Zest!